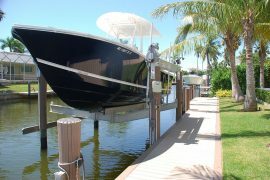 Naples Marine Construction offers safe, reliable lifts of all styles and sizes. 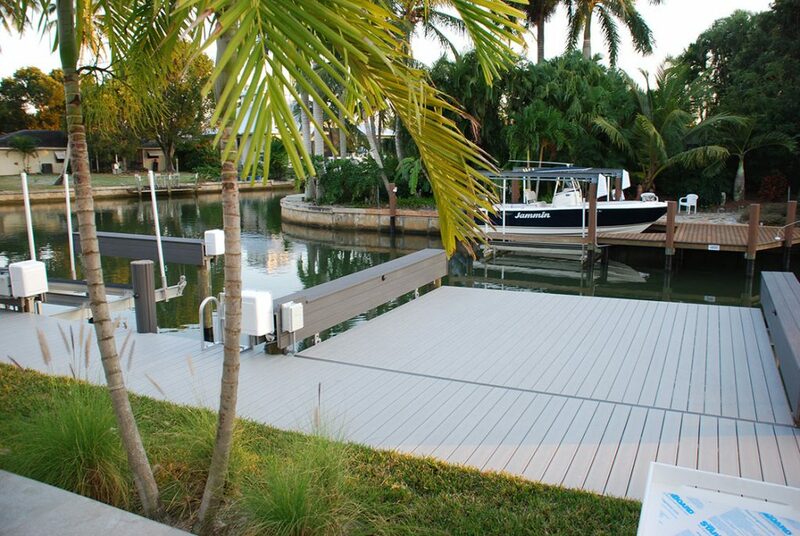 We will work with you to select the boat lift best suited to your property and boat. We utilize custom-made, heavy-duty aluminum boat lifts that can be designed to your exact specifications. Made here in SWFL, the lifts are of marine grade aluminum with high-grade stainless steel fasteners and components designed to stand up to the toughest conditions. Always remember to consider the “wet weight” of the boat as opposed to the builder’s weight. Fuel, equipment, and passengers add to the weight of your boat, so the weight capacity of your boat lift should generally be 30-40% greater than the dry weight of the vessel. Cradle boat lifts are the industry standard and the most commonly used type of boat lift. They typically utilize aluminum bunks, enclosed boat lift motors, and grooved cable winders. They are known for reliability, quiet operation, and speed. 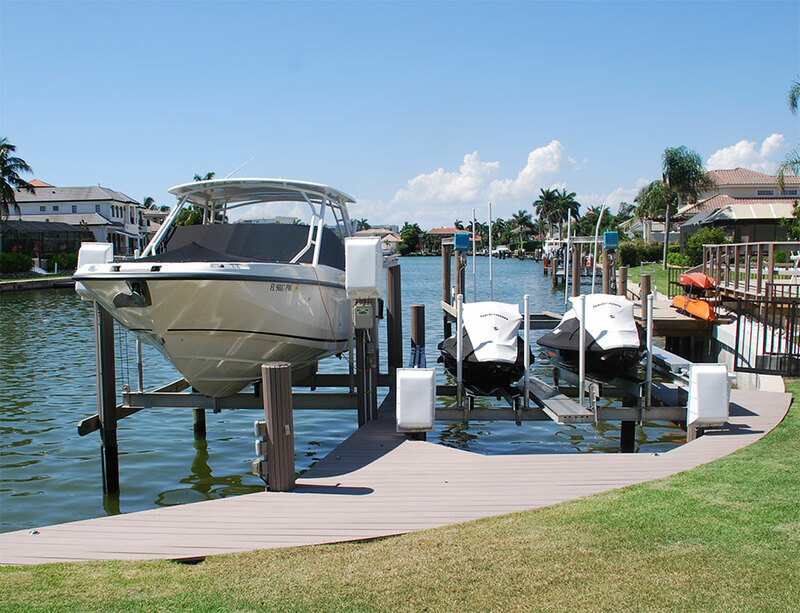 The lifting capacities can vary greatly with cradle boat lifts, but the experts at Naples Marine Construction can help you choose the optimal solution. We work with multiple lift manufacturers to ensure we meet your exact needs. 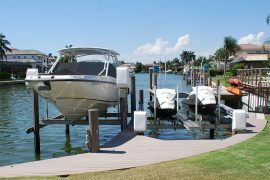 Elevator boat lifts are side-mounted to a dock, piling, or seawall. They resemble a forklift, and raise your boat out of the water in a similar manner. They are available in a variety of angles to accommodate shallow area bottoms. In addition, our team can create a design, which will maximize aesthetics and functionality. Platform lifts are available in standard or custom designs. The platform lift looks like an extension of your dock, but with the click of a button will lower and raise your boat or jet ski into or out of the water much like an elevator. All of our platform lifts are designed with custom fitted aluminum frames and utilize composite decking. We do this for two reasons: First, the weight of the aluminum frame helps to ensure it will properly submerge when lowered. Secondly, composite decking is the material best suited to withstand routine contact with water. Perhaps the most appreciated benefit to parking your boat or jet ski on a platform lift is that it makes maintenance a breeze. Personal Water Craft (PWC) or jet ski lifts are available in standard or custom designs to work seamlessly into your outdoor space. PWC lifts can be manual or electric and work in the same manner as the platform lift, making it safe and easy to mount or dismount your watercraft. Since jet ski maintenance is always recommended soon after the vessel is out of the water, the PWC lifts are also ideal for easily cleaning off salt water, blowing out any debris or water left inside, and draining the hull. Request a free consultation on your latest project by filling in the form below.